Priced at Rs 51.87 lakh, only 5 units of the Ducati Panigale V4 R have been allotted to India. This is the Panigale V4 R - the most powerful production motorcycle by Ducati. And it is now available in India at a sticker price of Rs 51.87 lakh ex-showroom. There’s a catch, however, only 5 units of the motorcycle will be sold in India. To give you a perspective of just how powerful the Panigale V4 R is, here’s some food for thought. Ducati test rider Alessandro Valia recently set the lap record for the fastest production motorcycle at the Buddh International Circuit clocking 1:56.316. Now, there are two things to note here – this lap time is faster than the fastest production car around the BIC – the Porsche 911 GT3. And it was clocked on the Panigale V4 S which makes roughly 6bhp less than the V4 R that has now been launched. Coming back to the Ducati Panigale V4 R, it was first showcased earlier this month at the EICMA show in Milan. While the Panigale V4 R makes about 6bhp more than the other V4 variants, it displaces 998cc instead of 1,103cc. This has primarily been done to meet the World Superbike regulations. The V4 R runs a shorter stroke essentially leading to a marginal reduction in the displacement. Aside from the change in the stroke, the V4 R also runs a few new components. It sports a new camshaft, bigger inlet, larger throttle body, titanium conrods and more. All of these changes have resulted in the V4 R pushing 217bhp and 112Nm. 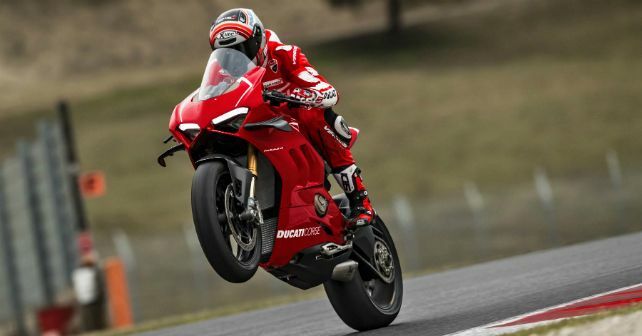 Ducati has also worked on the aerodynamics of the V4 R. The motorcycle makes extensive use of carbon fibre resulting in a weight reduction of 2 kilos over the V4 S – now tipping the scale at just 193kg. It also gets large winglets – inspired from Ducati’s GP16 MotoGP bike. This helps the motorcycle generate almost 30 kilos of downforce at 274km/h. Of course, to control the mad rush of power, Ducati has employed an extensive electronics package. From cornering ABS, wheelie control, launch control, slide control, quickshifter and more.